Saddleback Mountain & city views from this custom estate in Canyon Crest. Enter the foyer w/hardwood flooring & new paint. Upgraded bar w/granite counters, under counter wine fridge & soft close cabinets & drawers. Family room has laminate flooring, brick fireplace, custom built-in media niche & built-in speakers. Kitchen has ceramic tile counters, oak cabinets & drawers & stainless appliances. Formal living/dining room has built-in speakers & dual pane windows that stream in tons of natural light. Main floor bedroom w/upgraded bath is just down the hall w/Quartz counters, subway tile walk-in shower, built-in seat & handheld shower-head. Laundry room is located on 1st floor w/laundry chute. 2nd floor, you ascend a custom staircase w/wrought iron detail. 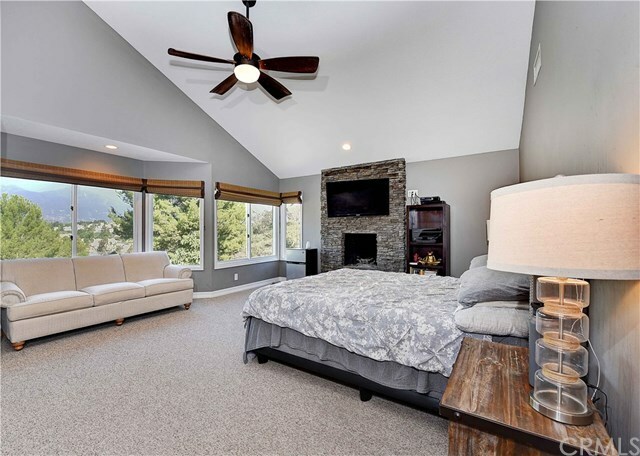 Master bedroom has dual pane windows w/views that have metal window screens & a stone fireplace. Master bath has Quartz counters, walk-in closet w/farm door, deep soaking tub, walk-in shower w/tile backsplash & stone flooring & water closet. Bedrooms 3 & 4 are just down the hall. 3rd upgraded bath has Quartz counters, soft close drawers & walk-in shower. 5th bedroom is currently used as a bonus room w/dual pane windows, plantation shutters, built-in speakers & beamed ceilings. Large backyard has a spa w/replaced heater & fire-pit. Added bonuses: Brand new water heater, 3-car garage & timed sprinkler system. HOA amenities â 24 Hour Gate Guard, 3 pools, spa, fitness center, 4 tennis courts, billiard room, playground & BBQ areas.